I usually use fan-made cards as text-only printed from a .doc file because I always assumed that printing out fan-made cards using the actual card design with full color and artwork would be way too expensive. But it occurred to me today that I could print them as photos at a place like Walgreens instead of using a home printer (color toner is sooo expensive...). And I looked up prices and found that printing 4x6 photos could easily cost only 10 cents each, which means I could print ten copies each of twenty cards (using blank space around the card to fill the 4x6 size) for $20. Not cheap, but to have my expansion look a lot more official, it might be worthwhile to me (once I finalize my cards of course), and hey hobbyists spend money on their hobbies. Has anyone else printed out full color versions of any fan-made cards? How do you do it? ..or do people just post mock-ups for the way they look online? Check out http://www.makeplayingcards.com/. I've done some looking around at many sites for professionally printing fan cards (although for games other than Dominion), and that site has a nice layout for printing your cards, and lots of quality options. There are other similar sites as well, and it is probably way cheaper than you think (I know it was for me!). The only issue with Dominion is the size of the cards. Make Playing Cards has many option for card sizes, but I'm not sure if they have the Dominion size or not. I use Artscow or Printerstudio for cards. Problem is that among these only the German version of Printerstudio does feature Euro-sized cards and they are nearly twice as expensive as other cards (about 0.2€ / card). I use the mock ups to play online using Tabletop Simulator. Used to occasionally print a few of them, but that's too bothersome for me now and i haven't done it in years. How do you use tabletop simulator? Just looking at the description, it seems like you'd basically have to program the whole Dominion game into it and then add the fan cards. Tabletop Simulator is a physics sandbox. It means that you, and whoever you conne t to online, can use their mouse to click on stuff, drag it around and let it fall down somewhere else. No programming involved at all. It's like on a real table - once you have the cards, you can either use them to play a game, or just throw them at your opponent, or whatever you can do with a physical card. Rules are not part of TS, you do that on your own. The software is more than basic physics, though. It also comes with a lot of prefabs and quite a few given functions, such as cards. You can deal cards, shuffle cards, and put them in your "hand" - an area where only you can see their front side. About how to get cards in there, most cards exist allready as free workshop items. The only thing you have to do is download those. To add your own, create a file containing your fan cards (there's a software for that that goes with TS, allthough a little hidden), upload that template on an image hosting site like imgur, and then import it. Takes five minutes at most. TS has no concept of rules, and is a bit slower than Dominion online, so i hope this doesn't discourage people of using the official implementation. The use case for dominion is really mostly fan cards, but it's very useful for that. Ok, when I first read "physics sandbox" I thought how can there be physics involved in a game simulator on the computer? But I get it now. I'd be nice if there was a trial period on it so I could see what it's like before paying. By my calculations, the closest size is Bridge size, which is 1/20 in (1.27 mm) too small in each direction (which doesn't sound like much, but would be obvious if you're paying attention). As long as you do not sell your self-made fan cards nobody cares. The printing company might care; they don't want to get sued. That's the sort of thing that might need written permission. If i'm not mistaken, Hans im Glück in Germany had some conflict with someone who printed his own Dominion cards in official card quality. I don't recall what exactly happened, but as far as i remember they were forced to so there wouldn't be a precedent. Might be my memory failing me, though. Either way, it's not as simple as it looks at first glance, and of course it also depends on the laws of the country you live in and who publishes the game there. You really need to look at it from two sides. You may be printing cards for your own use, and not for resale. But they are printing cards for profit. They could be liable simply because they were involved. Well I'm from Germany, but I don't think HiG plays a role anymore, right? Right. But the laws still do, i think. If i had a bit more time, i'd try to dig out the post they did back then, but sadly i don't really. Sorry. I think I am going to try the makeplayingcards.com for some custom made cards. It looks cool enough. It's 3 mm shorter and 3 mm thinner: does anyone think that will matter much when shuffling? Is there anywhere a good document with the correct colors for the 'back' of the cards? That's not how it works. Whenever you order something from a printing company you have to pseudo-sign something that says that all that stuff is OK, lawful, adhering to copyright and whatever such that they bear no responsibility in case you produce something illegal. 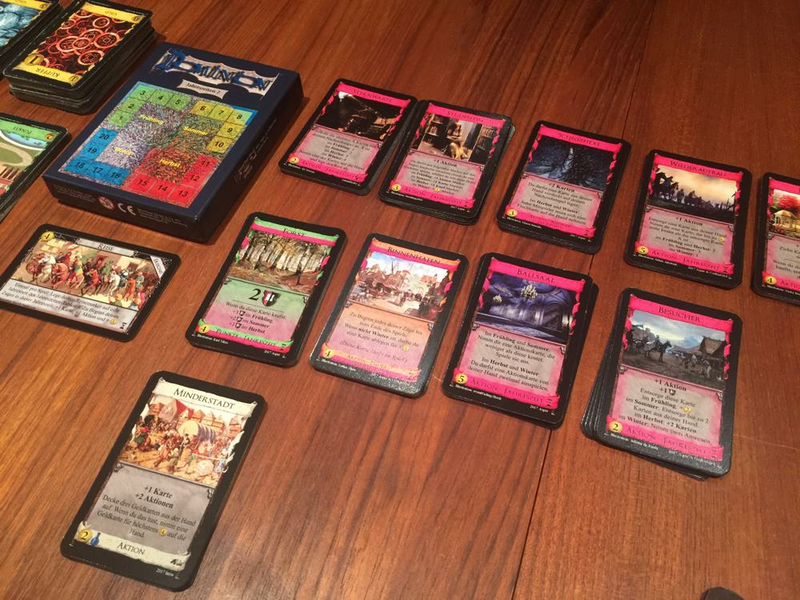 Technically speaking using official Dominion images is a violation of some stupid intellectual property right and practically speaking nobody cares if you print cards for your personal use or use them digitally on tabletop simulator or whatever. Hell, there are ample of people who share fan cards with pictures and the basic design of these cards is based upon offical Dominion cards so again technically speaking anybody who uploads a Dominion fan card anywhere is in breach of some copyright law. How much trouble is it to get all the cards in place to use Tabletop Simulator to play Dominion? From what I've gathered it sounds like you can use it to play Dominion against another player somewhere else. When you do this, can one person connect to and use another person's account in Tabletop Simulator, or would they both have to have paid for it in order to play each other? I would be willing to playtest your cards with you, if I have the time. I, too, am up for playtesting. Does anyone happen to have a template for a 'duration' and 'treasure' card that I can easily edit to make my own fan card? I am not great with photoshop and all and I already have a reaction, action, curse and victory card, but I could use a dud for the other two as well. I would also be willing to playtest. I'm still wondering if both people need to pay for Tabletop simulator in order to do that.